Frequently asked questions about flashing backlight technologies (scanning backlights, strobed backlights, black frame insertion), including how they work. Click the questions to see the answers. For info on ULMB / LightBoost / etc, see Motion Blur Reduction FAQ if you need to learn more about mainstream Blur Reduction modes on current gaming monitors. For newer engineering information, see Electronics Hacking: Creating a Strobe Backlight. 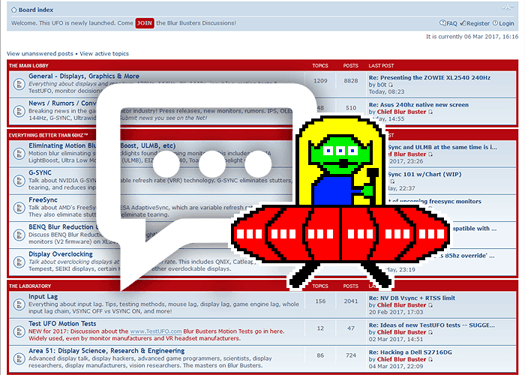 History Note: Before being renamed to Blur Busters, this website originally launched in 2012 as www.scanningbacklight.com. Q: What is a scanning/strobed backlight for? How do they work? A: A scanning backlight is a flashing backlight for a LCD display that reduces motion blur caused by eye tracking and movements, during fast motion. LCD displays are sample-and-hold displays and are continuously illuminated, unlike a CRT. See a high-speed camera video of LCD versus CRT being refreshed in real-time. Also see Science & References to learn how scanning backlights work, and check out manufacturer’s existing scanning backlight technology in high end HDTV’s. Q: What is the cause of motion blur for LCD displays? A: Motion blur on LCD displays occurs due to several factors, including pixel transitions (changing pixel state, GtG transitions) and persistence (static pixel state). A sample-and-hold display creates very high persistence and lots of motion blur even if transitions are instantaneous (see Why Do Some OLED’s Have Motion Blur?). Recently, with today’s faster LCD’s, pixel transition speed is only a minor factor in motion blur. On faster 1ms and 2ms monitors, pixel transition speed ceases to be a dominating factor after the first few milliseconds (e.g. 2 milliseconds) of a single refresh (e.g. 16 milliseconds for 60Hz refresh). A significant factor of motion blur on newer LCD panels is now caused by eye tracking motion. See an animation that demonstrates this clearly. In many older LCD technologies, pixel transition speed has been the major motion blur barrier. However, this is no longer the dominating factor in newer LCD panels. The slow pixel transition speed trait of LCD (influences motion blur) is different from the sample-and-hold trait of LCD (influences eye tracking motion blur). These are two separate disadvantageous traits of LCD from a motion quality perspective. The distinction between the two is important to understand, for a scanning backlight. With newer panels, the dominating factor for motion blur is now caused by eye movement, and pixel transition speed is no longer the dominant cause. See Science & References for more information, or check the next FAQ question below. Q: How is motion blur caused by eye tracking movements? A: Your eyes are continuously tracking moving objects on a screen. However, for sample-and-hold displays such as most LCD’s (see high-speed YouTube video of LCD versus CRT refreshing), an image is statically displayed for the entire refresh. Your eyes are still moving during a refresh, causing the static image in one refresh to be blurred across your retina, before the next refresh steps the image forward in the next frame. This motion blur factor persists even well beyond 120Hz, which is why even 120Hz LCD’s still have more motion blur than CRT. There are several academic papers that explain motion blur caused by eye motion, including eye tracking, and how it is a separate factor from pixel transition speed. Motion blur caused by eye tracking has become the dominant source of motion blur on modern LCD displays, instead of pixel transition speed limitations. Q: What existing displays use a scanning/strobed backlight? See high-end HDTV displays for some existing displays that use a scanning backlight. For example, Samsung use “Clear Motion Rate” (CMR) and Sony uses “Motionflow XR”, and several models of these displays combine both motion interpolation and scanning backlights. Only a few computer monitors (e.g. BENQ) take advantage of a scanning backlight, but only reduces motion blur slightly. Currently, high-performance scanning backlights (90%+ motion blur reduction) are not yet available in any PC monitor. The numbers represents a standard motion clarity equivalence to a “X fps @ X Hz” display. The proprietary names/trademarks, attached to these standard numbers, are used by some existing HDTV’s with scanning backlights instead of quoting “Hz”, and are sometimes viewed as marketing exaggerations by some reviewers. Measurements often show that they do not reflect real-world benchmarks (e.g. contrast ratio claims versus actual measurement). One impulse per display point (pixel) per refresh, similar to CRT. Actual number of backlight strobe impulses can sometimes be more than one per refresh on certain types of scanning backlights. Backlight diffusion between adjacent scanning backlight rows, can also lead to multiple impulses for a given pixel reaching the human retinas. This reduces measurable motion resolution, because multiple impulses are equivalent to repeated frames. Video taken with a slow shutter speed, often have built-in motion blur. Overcompressed video also have built-in motion blur, too. To ensure these are not limiting factors, the camera shutter speed must be faster at the source, than the length of the impulse at the destination display, and the video should not contain visible compression-related motion blur. For video games, artifical GPU motion blur effects should be disabled. How this applies to Samsung/Sony “960” displays: Many displays using a “960” equivalence uses 240Hz refresh, combined with a scanning backlight that’s dark 75% of the time. The LED impulse length is 1/960 of a second, with a period of darkness of 3/960 second between impulses (strobe duty cycle of 1/240 second). This results in 1/(1/960) which produces a motion equivalence factor of 960. The purpose of also doing a high interpolated framerate (240fps) is triple fold: It allows more impulses per second without needing a brighter backlight; it reduces scanning backlight flicker (240 Hz flicker instead of 60 Hz flicker); and it reduces stroboscopic effects. Also, other factors above, affect actual perceived motion blur reduction, such as backlight diffusion between adjacent scanning backlight sections. How this applies to CRT: It is already well known that 60fps @ 60Hz on a CRT, have much clearer-looking motion than even 240fps @ 240Hz on a LCD. This formula explains why CRT has far less motion blur than LCD — a CRT display has approximately a 1 millisecond phosphor decay. Such a display has motion fluidity that looks equivalent, to human eyes, as “CMR 1000” or “Motionflow XR 1000”, or a [email protected] display! No wonder CRT motion is so sharp, even at only 60Hz! Q: Is it scientifically possible to make LCD have less motion blur than CRT? The short answer: Yes, it recently became possible. 1. Pixel response complete by the end of the frame refresh cycle. 2. Very short strobes of backlight. Dark at least 90% of the time. 3. Very bright backlight to compensate for very short strobes. Pixel response complete by the end of the frame refresh cycle. Fortunately, some new LCD panels have finally become fast enough to eliminate noticeable ghost trails within one refresh cycle (about 16.67 milliseonds at 60 Hz). The emergence of 3D 120 Hz means that LCD panel manufacturers have an incentive to make them refresh more quickly, to allow alternate-frame active shutter glasses operation. LCD display makers have been working hard to clean up as much traces of pixel response (ghosting) as possible before the next refresh. Active shutter 3D glasses on LCD monitors briefly close both shutters (blocks both eyes) during the first few milliseconds of a refresh, when refreshing the screen between eyes. This is to hide as much LCD pixel transitions (GtG, as in Grey-to-Grey) as possible from being seen. Manufacturers have incentive to make LCD displays to refresh individual frames faster with less visible pixel transitions, in order to re-open a shutter (for one eye) in the shutter glasses sooner. Very short strobes of backlight. Dark at least 90% of the time. 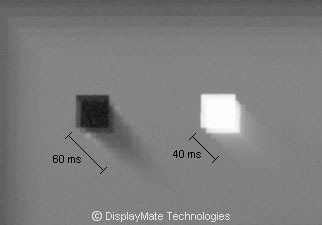 One very short strobe is needed for each point in the display per refresh, similar to phosphor decay in a CRT display, as seen in this high-speed video of CRT scanning. Different CRT displays have different phosphor decay times. Common CRT computer monitors typically have approximately 1 to 2ms of phosphor decay. While phosphor illumination is near-instant, the phosphor brightness fades more gradually over the subsequent 1 to 2 millisecond time period. 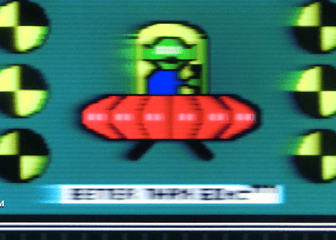 As seen in this high-speed video of CRT scanning, about one-tenth of a CRT display is brightly illuminated at one time during a 1/60th second refresh. In order to do the same with an LCD display, a scanning backlight needs to brightly illuminate only one-tenth (or less) of the display at a time, which means backlight flashes lasting similar to the length of phosphor decay. That is between 1 to 2 milliseconds out of a 16.67ms refresh cycle, about 10% of a refresh cycle. As a result, this requires a high-performance scanning backlight to be dark at least 90% of the time, in order to match the motion quality of a sharpness of a consumer CRT computer monitor. The shorter the illumination is, the better the motion quality is (Science & References). Backlight diffusion also must be well-controlled, to prevent much leakage of light from on-segments of backlight, leaking to the off-segments of backlight. A different solution to reduce or eliminate backlight diffusion from being a limiting factor to motion blur elimination, is to use a more rapid scanning backlight pass per refresh, or to use full-panel backlight strobes. Full backlight strobes are also more practical on newer LCD panels that do individual refreshes more rapidly. The important motion-blur elimination factor is that each point in the display is flashed as briefly as feasible, only one strobe per refresh. Very bright backlight to compensate for very short strobes. Very short strobes will normally result in a darker image. The backlight needs to be very bright (at least 10 times brighter than normal) to compensate for the very short strobes. As observed in the high-speed video of CRT scanning next to an LCD display, phosphors on CRT illuminate extremely brightly for a very short time period — at least 10 times brighter than a typical LCD backlight. Existing HDTV’s that use scanning backlights, do not have a backlight 10 times brighter than normal. These scanning backlights do not have short strobe cycles, so they do not reduce motion blur as much as a CRT display. In addition, these displays often have a dimmer image when the scanning backlight mode is enabled. Several models also combine motion interpolation, which is unsuitable for computer and gaming use due to input lag. Finally, the extreme amount of extra brightness can be extremely expensive to engineer into a backlight. Fortunately, the prices of LEDs have fallen dramatically. LEDs are well suited for scanning backlights due to their fast switching speed and brightness. LEDs are now available at costs less than 25 cents per watt at factory cost, and prices are continuing to fall. LEDs is also now available in mass-manufactured ribbon format, which may lead to cheap assembly and manufacture of ultra-bright backlights. It is now becoming increasingly possible to engineer an overkill of a backlight necessary for CRT-quality perfect motion on an LCD display, without a drastic increase in the cost of the display. For example, a 240-watt LED backlight for a 23″ computer monitor (about 150 watts per square foot!). All three major pre-requisites have now been largely solved for high-performance scanning backlights. This means it is now possible for LCD panels to have the same perfectly fluid motion that CRT displays have. The next move is to put the technology pieces together! Q: How do you bypass pixel transition speed as a motion blur barrier? A: Thanks to tests on new LCD panels, it has now recently become possible to bypass the pixel transition speed barrier. In some recently developed LCD displays, the vast majority of pixel transition speed is less than a single frame of a refresh. This provides an excellent window of opportunity for a massive motion-blur reduction from a higher-performing scanning backlight. It is possible to wait for pixels to finish refreshing, and then strobe the backlight after the pixels have largely finished refreshing, but before the next refresh. A single refresh at 60Hz takes about 16.67 milliseconds, and pixel transition speed has now become far less than this. The human eye sees the 0.5 millisecond strobe portion of a refresh that is visible, instead of the pixel transition speed portion of the refresh that is now made invisible by a turned-off backlight. Thus, the human eye no longer sees motion blur caused by pixel transition speed limitations, provided the display is able to finish refreshing before the next refresh cycle. Some displays use response-time acceleration technologies such as ASUS Trace Free, which helps eliminate perceptible ghosting completely before the next refresh. This image contains screenshots of an animated object from PixPerAn benchmark software provided from NCX’s review of the Asus VG236H monitor on the WeCraveGames.com forum. A scanning backlight can do a very quick, brief, bright “pulse of light” to illuminate a fully-refreshed portion of the LCD. This now allows motion blur reduction to approach CRT quality for perfect-looking crystal clear fast motion during video games. 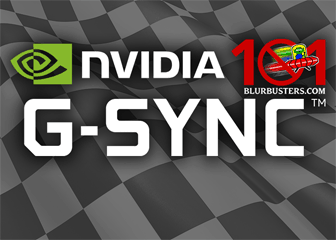 Q: Does nVidia 3D LightBoost reduce motion blur? Yes, it does. LightBoost is a strobed backlight, see LightBoost HOWTO. Also covered in this AnandTech article and TechNGaming article, nVidia 3D LightBoost is used in 3D computer monitors that have recently come onto the market. This is a strobed backlight with a dual purpose: More light when 3D shutter glasses are open (and turned off when 3D shutter glasses are closed); and to also reduce motion blur using fairly short impulses. The backlight impulses using LightBoost (at the time of this writing) are not nearly as short enough to have less motion blur than CRT. However, future LightBoost implementations can achieve this, by cramming an extremely bright 250-watt LED backlight into a 23″ monitor. In this case, such a monitor will finally have less motion blur than a CRT. It is a full-strobe-only backlight, rather than a sequential scanning backlight. However, at 120Hz, a full strobe does not noticeably flicker to most people. At the time of this writing, it is not known whether 3D LightBoost can be enabled in 2D mode, without 3D glasses. Q: What is the relationship between backlight strobe length and motion blur/brightness? – Inaccuracies in eye tracking, which increase during faster motion. – Motion blur in source material (e.g. long exposures, soft focus, compression artifacts). – Diffusion in scanning backlights. Not applicable for full-strobe backlights (e.g. LightBoost). – Pixel transition leakage between frames (crosstalk). This is better on 1ms panels such as XL2411T or VG248QE. For further reading, see Science & References. In addition, the direct linear relationship can easily be confirmed via motion test software such as PixPerAn, especially on crosstalk-free 1ms panels with a strobe backlight enabled (e.g. BENQ XL2411T or ASUS VG248QE with the LightBoost HOWTO). Q: What type of video material benefit the most from a scanning/strobed backlight? From a motion-blur reduction/elimination perspective, a scanning backlight benefits live fast-motion material the most. There is much less motion blur elimination for movies and low frame rate material (non-interpolated). The best material for scanning backlights, include high-framerate video games or fast live action that contains lots of fast pans (e.g. fast pans in football/hockey, NASCAR racing, ski racing, bike racing, Red Bull air races). Other computer operations, such as smooth-scrolling of text and web browsers, can benefit noticeably from a scanning backlight that allows crystal-sharp moving text. For example, 60 fps at 60 Hz. This prevents frame repetitions from producing sample-and-hold effect (judder), which contributes to perceived motion blur. For example, a camera with a quick shutter speed, or sharp frames generated from a video game. 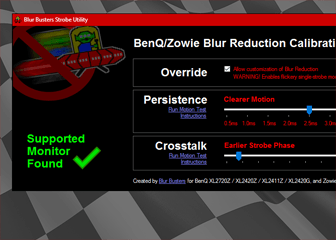 This prevents blurriness built into frames from contributing to motion blur. The faster the motion, the more noticeable motion blur becomes on a LCD display with a regular backlight, in situations where motion remains sharp on a CRT display. Q: Will a scanning backlight/strobed backlight flicker too much? A scanning backlight can be prone to the same CRT disadvantage of flicker. The simple solution is to use a higher refresh rate for flicker-free operation. Today’s gaming LCD computer monitors can operate at a 120 Hz native refresh rate, and would be flicker-free (for most people) similar to a 120 Hz CRT display. In addition, a scanning backlight can be enabled/disabled via a button run as a traditional backlight when the motion blur benefits are not needed (e.g. using word processor instead of a game). Most existing scanning backlights for HDTV’s use frame interpolation to increase the refresh rate before using a scanning backlight to reduce motion blur further. However, the BlurBusters scanning backlight design does not use frame interpolation, and has none of the disadvantages of frame interpolation. Q: Strobing the backlight will dim the image. How do you compensate? Correct! A scanning backlight needs an extra-bright backlight to compensate for the long dark time between strobes. Most scanning backlight in existing technology are dark only 25% to 75% of the time, and only reduce motion blur by that much. In order to reduce motion blur by 90%, you need a backlight that is dark 90% of the time, and lit only 10% of the time once per refresh. This requires a backlight that is 10 times brighter than necessary for a normal computer monitor. 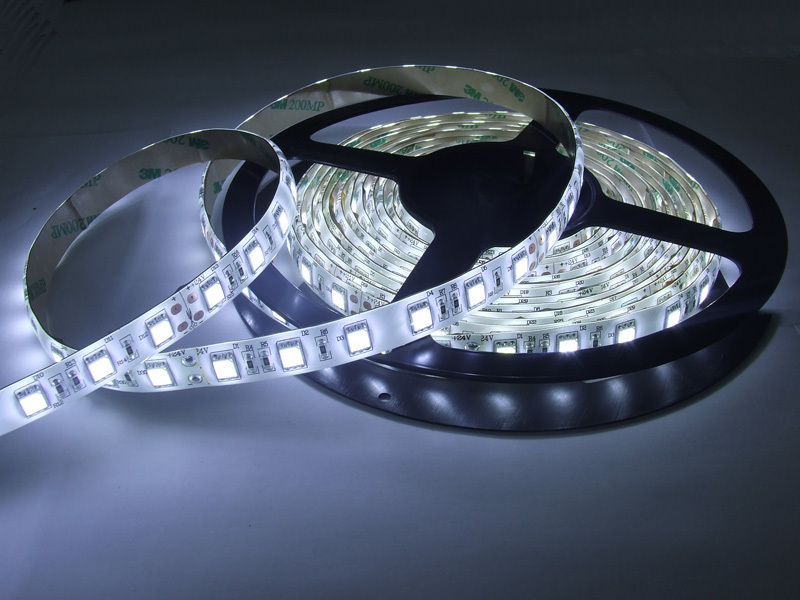 Fortunately, LED ribbons have fallen in price to under $1 per watt, and is less than 25 cents a watt at factory cost. It is now possible to cram 200 watts of LED’s behind a 24″ LCD panel that normally use a 10-to-20 watt LED backlight. (Due to strobing, the power consumption would still average 10-20 watts!). This wattage is suitable for a scanning backlight capable of 90-95% motion blur reduction. Q: Tell me more about inexpensive LED ribbon lights. These ribbons are easily cuttable using scissors at intervals (with convenient solder pads), to allow multiple shorter ribbons, which can be stacked edge-to-edge for a scanning backlight for a computer monitor. More expensive variants of these ribbons are now available in 6500K with 80 CRI suitable for backlighting use. These use surface-mounted #3528 LED’s, at 600 LED per 5 meters (120 LED/meter), 10 watts per meter, and the ribbon is 8mm wide. Tiled edge-to-edge tightly at over 2,400 LED’s for a 24″ display, this yields a total LED wattage of over 200 watts that can be crammed behind a single 24″ LCD panel. Brighter #5050 LED ribbons are 10mm wide, 60 LED/meter, 14.4 watts per meter, and 72 watts per ribbon, and results in 900 LED’s for a 24″ display. High-quality #5050 LED’s (21-22 lumens/LED) are about three times brighter than #3528 LED’s (6-7 lumens/LED). This also leads to a similar amount of wattage for a backlight. This results in nearly 20,000 lumens of light capacity, and can be strobed at higher peak brightness (over 40,000 lumens for a 24″ monitor! ), bright enough to equal the brightness of CRT phosphor at peak (overexposed in the video). Despite the large wattage in LED, it is mainly dark wattage. Actual consumption would be only 10-20 watts because the backlight is strobed briefly, and the actual average lumens will become similiar to a regular computer monitor, but without the motion blur. This is sufficient wattage for a scanning backlight that can reduce motion blur by 90-95%. The huge number of LED’s, coupled with an appropriate backlight diffuser, eliminates most visible non-uniformities. These LED’s have virtually instantaneous switching time (rated at over well 1 million on/off cycles per second), which is far more than speedy enough for a scanning backlight. Phosphor decay of most white LED ribbons is less than the phosphor decay of CRT, so phosphor decay of LED ribbons will not be the limiting factor for matching CRT in motion resolution. The ribbons have fallen in prices (if ordered directly from factory) to dimes and quarters per watt, which now make high-performance scanning backlights much more practical today, than it was several years ago. Note: Common Google and eBay searches for “600 LED ribbon” and “600 LED tape” reveals thousands of results from many different manufacturers, high end and low end, as this type of product is already commoditized all the way from basic industrial-quality lighting all the way to museum-quality high-CRI illumination. Manufacturers already make surface-mount #3528 LED chips for small backlights, and these same LED chips are already mass-produced in ribbon format. Q: Is “black frame insertion” the same thing? Scanning backlights have the same purpose as black frame insertion. They reduce motion blur by using a large dark period between refreshes. They are simply different terminologies and methods that do essentially the same thing. The term black frame insertion generally refers to full backlight strobing (or frame refreshes that are completely black), and scanning backlight refers to sequential illumination of backlight segments in a top-to-bottom fashion (similar to a CRT). However, some manufacturers use “black frame insertion” to refer to a “scanning backlight”. A scanning backlight that is dark 90% of the time, is conceptually equivalent to black frame insertion that used 9 black frames for every 1 actual frame. Note: There are other subtle factors at play (e.g. backlight diffusion between adjacent backlight segments during a scanning backlight, stray light leaking throughout the entire backlight) that affect the approximate perceived motion blur reduction. Q: Is scanning the backlight better than flashing the entire backlight at once? Short Answer: Depends on the LCD panel. Scanning the backlight is useful to keep the backlight synchronized with the LCD refresh. Most common LCD monitors refresh pixels in a top-to-bottom fashion. Over a period of a single refresh (e.g. 1/60th second), an LCD monitor does the equivalent of a rapid “wipe transition” from one frame to the next frame. For most LCD panels, this “wipe transition” occurs from the top edge to the bottom edge of the screen. Trailing the refresh is still incomplete pixel transitions within a refresh. This is visible in high-speed camera video when observed carefully. Thus, the scanning backlight attempts to trail behind the top-down refresh by a few milliseconds, in order to prevent illuminating LCD pixels that are still in transition. It is desirable to illuminate the part of LCD only when that part of the LCD is practically finished refreshing and no longer has significant effects from leftover pixel transitions. A new development in LCD panels is 3D, using active shutter glasses. Such LCD panels fast-scan a refresh, as quickly as possible, while both shutters of 3D shutter glasses are closed for the first few milliseconds of a refresh. This is to prevent the majority of pixel transitions from being seen, while waiting for a refresh during alternating between eyes. Such panels are more suitable for strobing the entire backlight at once, since the pixel transitions for the entire screen, has settled more quickly and more concurrently throughout the whole panel. Strobing the entire backlight at once, have a major disadvantage of more uncomfortable flicker at lower refresh rates. However, this becomes a non-issue for most people at higher refresh rates (especially when approaching common frequencies of PWM backlights). One major advantage of strobing the entire backlight at once is the complete elimination of backlight diffusion within a scanning backlight (“on” backlight segments leaking light into “off” backlight segments) from interfering with motion blur elimination. Note: A refresh cycle at 60Hz is about 16.67ms. On some recent modern LCD panels, most of the pixel transitions is complete during the first 2 milliseconds, and human-perceptible ghosting is virtually gone well before the end of the 16.67ms refresh. Q: How do you modify an LCD display panel to add a strobe backlight? See Electronics Hacking: Creating a Strobe Backlight for instructions on modifying existing LCD’s to utilize a strobe backlight. Q: No modifications to the LCD display’s electronics is necessary? For 60Hz, no modifications to the computer monitor’s electronics is necessary, unless you need a custom response time acceleration algorithm which is more necessary for IPS or for higher-refresh-rate LCD’s. It is possible to design a scanning backlight mod for an existing computer monitor that only requires access to the VSYNC signal, which can be obtained at any point in the display chain, or even signalled from the computer (with precise time coding). A one-time scanning speed & timing calibration produces excellent synchronization with the LCD refresh, without needing access to the LCD refresh electronics. For more information, see the next FAQ question. Q: How do you synchronize the scanning backlight to the LCD panel? The original BlurBusters scanning backlight design, driven by an Arduino, only requires access to the VSYNC signal. The VSYNC signal is a convenient way to signal the start of a refresh, and provides the basis for scanning backlight synchronization. This scanning backlight design simply uses a pre-programmed scanning speed in order to keep the top-to-bottom backlight scanning in good sync with the top-to-bottom LCD refresh cycle. This adjusts how fast the scanning backlight scans within a refresh. This is a one-time adjustment to approximately match the scanning speed of an LCD refresh. This adjusts the timing of the scanning backlight sequence relative to the timing of the VSYNC. This adjusts approximately how far behind the strobes occur behind the LCD refresh. This adjustment also adjusts for input lag. In addition, it can also adjust for a trade-off between ghosting-elimination / input-lag trade-off. A simple moving test pattern can be used while doing these calibration adjustments, to find the point of maximum image quality during fast motion. Adjustments will simply show increased/decreased cross-talking artifacts similar to the image leak between eyes for active 3D shutter glasses. Once this adjustment is achieved, the adjustments never have to be done again for a particular video mode for a specific monitor. The above calibration adjustments do not need to be ultra-precise. The error can be up to +/- tens or hundreds of microseconds without any precision-related image artifacts noticeable to trained humans. This precision is easily achieved with a simple Arduino and other common microcontrollers. What is important is that consistency of scanning backlight operation between consecutive refreshes (VSYNC to VSYNC) remains precise, and no other temporal effects interfere with image quality during scanning backlight operation, such as sub-field temporal dithering. Q: How can you synchronize a scanning/strobe backlight to VSYNC? Tap into the monitor’s internal electronics. Very monitor specific, requires an oscilloscope to hunt for the signal tap required. Tap into the video cable. VGA is easiest, while DVI/HDMI requires creation a custom “dongle” circuit. HDCP also complicates the ability to add a circuit in-line with the cable. Tap into 3D shutter glasses emitter. Shutter glasses mode specific, may not work for 2D mode. Software signalling from computer over USB/serial. Monitor and GPU flexibility, but OS dependent and not compatible with consoles. Requires precise timecoding algorithms to compensate for CPU & USB variances. Q: Is there input lag with a scanning backlight? This depends on how the scanning backlight is calibrated, in how soon the backlight strobes after the LCD pixels are refreshed. In the best case, a scanning backlight introduces practically no input lag. In the worst case, a scanning backlight adds less than 1 frame of input lag. For a scanning backlight operating at 120 Hz native (approx 8.3 ms per refresh), the increase in input lag would be about 4 ms. When the scanning mode is disabled (scanning backlight configured to operate as a regular LCD backlight), no increased input lag occurs. Note: Some existing HDTV displays use a scanning backlight combined with motion interpolation to multiply the Hz rate. The motion interpolation creates a significant additional input lag. 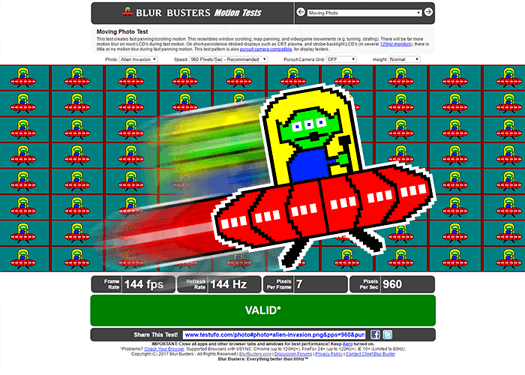 Mark Rejhon’s BlurBusters scanning backlight design is designed to be suitable for computer use and games, and does not use motion interpolation. Q: Why strobe only once per refresh? The key is actually one strobe per point on display per refresh. Strobing can be done a point/pixel at a time (e.g. 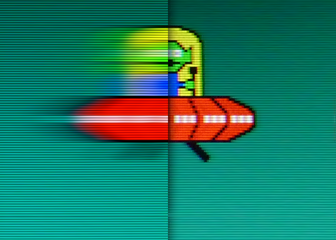 CRT), a section at a time (e.g. row of LED’s), or full screen at a time (e.g. strobe the whole backlight). Squeezing a lot of light output, into a short time period, just once per refresh is necessary to gain maximum motion blur elimination without using motion interpolation. Doing multiple strobes per refresh, for the same part of the screen, can be equivalent to repeated refreshes of the same frame, which leads to more perceived motion blur. A CRT display only illuminates phosphor once per refresh. On a good plasma display, the multiple subfield refreshes are compressed into a tiny time period. This resembles a single strobe, even though it consists of multiple rapid strobes in an extremly small time period. From a motion blur elimination perspective, multiple rapid strobes is equivalent to one strobe lasting from the first strobe to the last strobe. For LCD displays, a good scanning backlight aims to do the same by illuminating only once per refresh. Not all scanning backlight is designed illuminate only once per refresh, and this type of scanning backlight do not provide a huge amount of motion blur reduction. Q: Does temporal dithering affect scanning backlight operation? In short, no. Some older LCD’s use temporal dithering to expand a limited colorspace (e.g. 6-bit) into a wider colorspace (e.g. 8-bit), but this is from full frame to frame. This type of temporal dithering is usually fully compatible with a scanning backlight. If an LCD does temporal dithering (turning on/off pixels several times during the same refresh), it can interfere with image quality with a scanning backlight. Variants of temporal dithering techniques is used for plasma and DLP displays, but is not used in the majority of LCD’s. Q: Is contrast ratio also enhanced? Not necessarily. However, any backlight, including a scanning backlight, can be specifically designed to also enhance contrast. There are two common backlight methods of enhancing contrast ratio. They are dynamic contrast and local dimming. Most common displays use dynamic contrast, which dims the entire backlight for the whole image during dark scenes. The average brightness level of the image is converted into a backlight brightness in real-time, every refresh. This does not enhance the contrast between blacks and whites during the same static image, and only enhances contrast between different scenes. More expensive displays utilizing LED backlights, including some HDTV’s that use scanning backlights, use local dimming in the form of a full-array LED backlight. Parts of the backlight is dimmed or turned off behind the dark portions of the scenes. This enhances contrast between blacks and whites during the same static image. As of year 2012, no consumer computer monitors use local dimming. Q: Can you give scientific references? There’s a good list in the Science and References section. Q: I can’t build it! Can I buy one pre-built? Just purchase a LightBoost computer monitor. They provide up to 92% motion blur elimination today in an off-the-shelf computer monitor! Some four-figure-priced displays for home theater have a scanning backlight but they generally do not have 90%+ motion blur reduction either, and they have the additional disadvantage of also utilizing motion interpolation which is unsuitable for computer use and games, due to input lag (delay in response to interactive human input). One notable exception is the new Sony Motionflow Impulse strobe backlight, which is Sony’s equivalent of LightBoost. Q: As a user, how can I get a monitor manufacturer interested? Q: I’m a monitor manufacturer and I’m interested. May I use your design? See Electronics Hacking: Creating a Strobe Backlight. Q: What are the pros and cons of a scanning/strobed backlight, versus motion interpolation? The BlurBusters scanning backlight design aims to overcome the disadvantages, by using ultra-high brightness (e.g. 240 watt backlight for a 23″ monitor), and using a 120 Hz native computer refresh rate (e.g. to eliminate 60 Hz flicker, and to avoid motion interpolation). When using lightsboost at 120Hz, should i keep fps capped @120 or not. So I have been more confused than anyone as of lately. I am looking to buy a new 3D projector and cannot find out some simple info on ALL 3D Devices in general. – Are ALL 3D labeled devices required to have a 120hz (60hz per eye) spec? I AM NOT TALKING ABOUT MOTION INTERPOLATION nor a back scanning light. Seems like the older model of the projector I want could do 120hz 3D mode? I checked the manual for the newer model but it says 60hz? So I thought ARE all 3D devices required 120hz/60hz per eye minimum? Or are some devices 60hz MAX and claim to handle 3D? BTW The Projector I want uses DLP Link Active Shutter Glasses and requires them. That fact alone would make me assume its 120hz like ALL other newer 3D projectors. I also found in the manual where the timings and resolution modes for 3D formats are listed… Something strange… It said the 720p (1280×720) Frame-packing 3D mode supported 90Khz Horizontal Scan rate : If you do the formula to find MAX refresh rate for that display mode @ 1280×720 : You get a surprising 119hz?! So does that mean it DOES support 120hz in (1280×720) 720p BUT only in Frame-packing 3d mode? All of these numbers confuse the hell outta me. I just need someone to clear the air on somethings… Am I wrong? Please ANYONE Correct me if I am wrong. I have had one other professional person who sells 3D hardware and knows more than me tell me I am wrong. He says Frame-packed 3D format requires a minimum of 120hz (60hz per eye) AND THAT ALL 3D DEVICES PERIOD HAVE THIS SPEC OR ARE NOT 3D OR CONSIDERED 3D. – Even if HDMI supports it, the TV electronics may not. – Yes, 120Hz as referred to for 3D, is often mainly used by frame-sequential 3D. BUT it can also be confusingly applied to frame-packed 3D, see semantics catch. – No, not all 3D labelled devices are required to do 120Hz (60/60). There are other 3D formats I’ve used (e.g. old shutter glasses systems at 30/30 per eye) Varies. But there’s a semantics “catch” that gives truth to “all do 120Hz”; see below. Frame packing is a format that’s a bit confusing to understand sometimes, but see this diagram. Frame packing is either a 1920×[email protected] signal trying to mimic a 1920×[email protected] signal — by embedding two frames and a blanking interval, into one 60Hz refresh. So sometimes it’s called 60Hz and sometimes it’s called 120Hz. Both can be interpreted as correct depending on how you interpret the frame-packed signal. A frame-packed signal can look remarkably similiar to a frame-sequential signal, because it’s simply a trick of squeezing two refreshes into one refresh (or two frames into one frame, if you prefer to call it that) to solve a solution (e.g. addition of 3D to 2D without changing specs too much). This is the semantics catch that people are caught off guard by. You can see it in the HDGURU diagram. (It’s kind of like the old days when people argued whether 480i (interlaced) was 60Hz or 30Hz — when there’s are 60 images per second as separate interlaced fields, by putting two separate images into the pair of fields of one frame. So 60Hz refers to the field rate, while 30Hz refers to the completely-scanned frame containing the two interlaced field passes). Also, in addition, there’s further confusion when we’re talking about *source* encoding of 3D. For examples, movies may be stored as a pair of 24p frames, and it can be the player — and/or it can be an intermediate box or the display — that convert it to an appropriate 3D format (e.g. frame sequential, frame packed, checkerboard, etc). how can I test if I use light boost? 1. Bring up the monitor OSD menu. Does it say “3D Mode”? 2. The picture looks different from regular 120Hz. should I put the monitor on 120hz or 144hz? 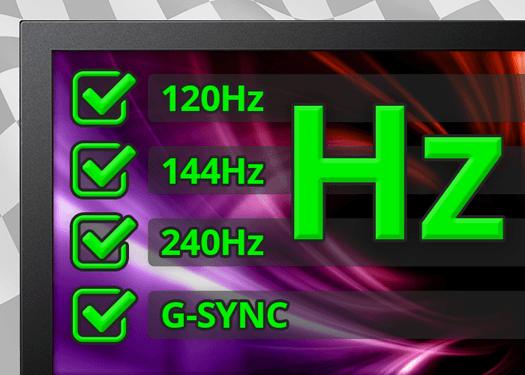 To take advantage of LightBoost, you want 120Hz because LightBoost isn’t supported at 144Hz. There’s less motion blur with LightBoost 120Hz, than with non-LightBoost 144Hz. That doesn’t prevent you from using either mode whenever you feel like it, you can switch between 120Hz and 144Hz, to enable/disable LightBoost. (1) Strobe backlights can be vastly superior to scanning backlights, for motion blur reduction/elimination. This is due to the elimination of backlight diffusion. LightBoost strobe backlights already exist. (2) It’s much easier to do a strobe backlight with an edgelight. 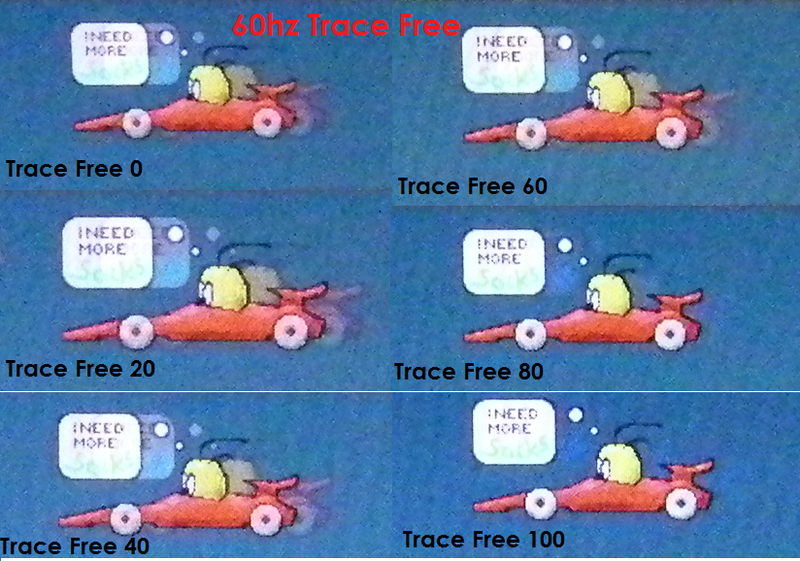 (3) For scanning backlights, most of pixel transitions must fit mostly within a single refresh. (4) For strobe backlights, most of pixel transitions must fit mostly within a blanking interval between frames. (high speed video). This likely limits you to TN panels, since 1ms and 2ms panels are able to pull this off (at least with a lengthened blanking interval). Creating a custom resolution (timings) can allow you to lengthen the blanking interval (vertical front/back porches and sync pixels configuration). Get familiar with timings tweaking (e.g. nVidia Custom Resolution) if you plan to attempt a strobe backlight. (5) You may need tweakability in the response time compensation. 20ms gives too much inter-frame bleeding and would give multiple “sharp ghost” trailing “after image” artifacts (which some LightBoost users are familiar with, especially VG278HE users which has more of than than VG248QE or XL2411T). A possible good candidate for strobe backlight modding is a 1ms TN 60 Hz panel, especially if you are able to overclock the refresh rate. If you want IPS color quality, you can’t yet (easily) use a strobe backlight instead of a scanning backlight, unless you overclock it to 120 Hz and then strobe at 60 Hz — every other frame, or use a very massive blanking interval, — as you can’t yet fit IPS pixel transitions into a single vertical blanking interval at 120 Hz. The faster scanout of 120 Hz allows more time for IPS pixel transitions to settle. The two-pass refreshes helps strengthen the solidness of pixels before the strobe. There would be lots of flicker. You’d frame-limit your games to 60fps (may need to program a utility to keep 60 fps frame limit “in sync” with the 60 Hz strobe backlight). Essentially, you would run at a 120 Hz refresh rate, but strobe at 60 Hz, in order to gain less motion blur — much like CRT [email protected] has less motion blur than standard LCD [email protected]) The main benefit is gain IPS color quality and zero motion blur on IPS panels, but have far more flicker than TN panels. Over 1000 watts of LED ribbons ordered! | The LCD BlurBusters!